Retrofit packaging machinery on a complex packaging line to include handling robots without jeopardising reliability or delivery times. Roboplan redesigned the entire production plant, replacing old Scara robots with FANUC LR Mate 200iD robots at the end of the line. These robots proved to be ideally suited to the challenging task of placing the cans Hoffmann produces into boxes. Flanged edges on the cans meant that the robots needed to be extremely dexterous. 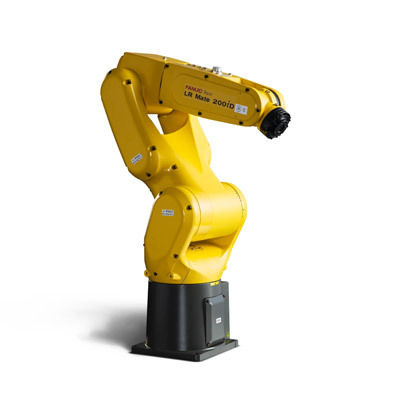 Because they are capable of tilting them in at an angle, 6 axis Fanuc LR Mate compact robots guarantee that the cans are placed correctly in the boxes. LR Mate robots achieve very high work rates. For Hoffmann Neopac, as a manufacturer of metal and plastic pack-aging ("tins and tubes“), prompt delivery to the customer is a matter of course. In order not to jeopardise this reliability, the company de-cided to retrofit the packaging machinery. The control and robots were replaced. The mechanical elements in good condition were left intact. The benefit lies in restoring the high system reliability and availability. Designers created some veritable gems when tin cans came into fashion. Yesterday's zeitgeist in tin plate has now turned into valuable collector's items today. Many of them originate from the Swiss city of Thun, and were produced by Hoffmann. This fifth-generation family-owned enterprise has been passionately dedicated to the tin can as packaging for over 110 years. Today more than ever, Hoffmann Ne-opac stands for tin cans with high-quality design and individual deco-ration of tins. With its own R&D department, production, and print shop – the com-pany creates commodity products for customers around the world, yet in such an individual way, that many tins are still regarded as col-lector's items. And as traditional as the "tin" product may be: year after year, there are innovative ideas that always garner prizes such as the "Swiss Star" (for a Ricola fresh pack tin) or a silver medal at the "Can of the Year" awards. If a tin package is not currently winning an award, then it is a childproof cannula tube made of plastic, which received a Swiss Star in 2013. Innovation out of tradition, so to speak. Every tin is created more or less the same way. Out of flat sheets of metal, parts are stamped, bent or formed, mounted and finally pack-aged. Whilst there is quite a lot going on in stamping, all the subse-quent phases do not involve heavy mechanical processes. That is why they keep on running for years, or rather, for decades. The mechanism of the conveyor units and robot cells, "only just run in" after twenty years, was and still is in impeccable condition. The housing still meets the specifications. The deployed Scara robots, however, were getting older and were starting to become erratic. Down times had become too frequent, repair technicians had to spend far too much time keeping the old robots running. The automa-tion specialist from Robofact promised to help. Fabian Anderegg, Division Head at the system integrator Robofact AG, Gossau: "The system was practically no longer documented." For many years, no one had kept track of modifications. This is unheard of for modern maintenance and repair practices. At Robofact, a CAD model of the system was created; they documented the mechanics, pneumatics and electrical installations practically as if it was a new system. An-deregg: "With the retrofit, Hoffmann Retropak received an entire plant documentation." Beat Lehnherr, Head of Service and Mainte-nance at Hoffmann Neopac, sees the retrofit objective as having been accomplished: "Now we know the system inside and out again." In monetary terms, this knowledge is less important for daily production than for maintenance, servicing, as well as further development. Robofact had to first document all the special features at the begin-ning of the project and prepare the plant model. The design and overhaul on-site naturally proceeded in close cooperation with Hoff-mann repair technicians. Anderegg: "We tested the software com-pletely in-house and thus simulated the entire process." The diligent taking of inventory and the well-designed concept required little re-working, according to the system engineer. The program created by Robofact only had to be loaded into the system controller. The fine-tuning on-site was performed jointly and also took very little time, thanks to good preparation. With the installation of a new control, Robofact also installed a new user interface. At the end of the day, Lehnherr cites two main crite-ria: "The new user interface is much more clearly arranged, and the product selection is easier during a size change." Both factors have ramifications for the productivity and availability of the system. Op-erator errors are practically ruled out. Anderegg explains the proce-dure: "All the 'recipes' are stored in the control and are called up completely by fingertip on the touchscreen." The current user inter-face is password-protected on the various levels. Only the keys neces-sary for operating the system are even directly accessible to the op-erator. Based on experiences in practice, the simplified handling of the various programs and inputs directly leads to a lower error rate and thus to higher availability. During format changes in the past, it was necessary to go into the robot program and input individual pa-rameters. And whilst formerly, when there was an error in the sys-tem in the past, only a red signal lamp indicated the downtime, now errors are indicated in plain text. The message "Cylinder xy cannot deploy" shortens the troubleshooting process tremendously. In addi-tion, all the surfaces now have a unified design, which facilitates a better overview. The old Scara robots were replaced by LR Mate 200iD articulated arm robots. The six-axis FANUC robots were preferred due to their additional degrees of freedom. The reach of 717 mm and the maxi-mum payload of 7 kg, however, were not the decisive factors. But Lehnherr is not unhappy about it either: "More flexibility is always good." After all, this also applies to packaging routines. What all packaging specialists know: The last row is always the most difficult. Because some of the cans have flanged edges, the last row does not always fit into the box equally well for each design. That is why mo-bility is required by the robot, which when placing the cans in the box, may have to also approach the box from a tilted angle. The company saved the trouble of a cycle time analysis of the FANUC ro-bot: "It is so fast, that it can easily keep up with any interval." Depending upon the size of cans and the packaging units, between six and nine cans are made available to the robot in the grip position. Then the LR Mate always grabs an entire row of cans. During a for-mat change, the matching attachment is retooled outside the cell. The attachment can be changed with just a few steps. A line where the overhaul was only recently completed is Line 8. Overall, Thun has ten lines of this type. The configuration is more or less identical. At the beginning of the line, the individual parts of a tin are stamped, subsequently bent, mounted and packaged. Line 8, for example, runs at 80 strokes per minute. This output was not neces-sarily improved by the new robot. You simply cannot outsmart the laws of physics by retrofit. Beat Lehnherr: "With the new robot, how-ever, the reliability is significantly improved. And at the end of the day, that ultimately leads to higher unit quantities." In this, the robot is running at 60% of its maximum speed at best. There was also another reason for leaving the system configuration intact, as Lehnherr explains: "The entire production and assembly process is divided up so that the individual stations are manageable." The complexity of the individual lines is a function of the entire pro-cess. During the tour of the system, people were told: Please wear protec-tive clothing! After all, it (also) involves food packaging. And to pre-vent any misunderstandings, all the machines are run on FDA-approved oil or grease. A classic example are the so-called 3-piece tins – a very descriptive name for the traditional tin can, consisting of a bottom lid, body and top lid.